Professor Sunghoon Kwon (Seoul National University) won the 13th “Pioneers of Miniaturization” Lectureship, sponsored by Dolomite and Lab on a Chip. The “Pioneers of Miniaturization” Lectureship rewards early to mid-career scientists who have made extraordinary or outstanding contributions to the understanding or development of miniaturised systems. 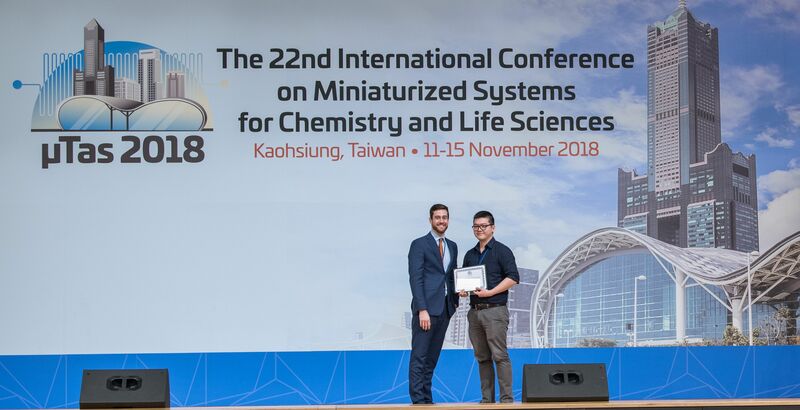 Professor Sunghoon Kwon received a certificate, a monetary award and delivered a short lecture titled “Miniaturization for Personalised Medicine” at the conference. Lab on a Chip Executive Editor Simon Neil and Greg Cooksey from the National Institute of Standards Technology (NIST) presented the Art in Science award and a cake featuring the winning image at the Royal Society of Chemistry booth to Nam-Trung Nguyen for his entry “The Green Planet”. This award aims to highlight the aesthetic value in scientific illustrations while still conveying scientific merit. Left to right: Simon Neil (Lab on a Chip), Greg Cooksey (NIST) and winner, Nam-Trung Nguyen with the personalised cake, and the winning image ‘The Green Planet’: an image of a floating liquid marble, decorated with green fluorescent beads. The image was taken with a colour USB camera. The liquid marble is made of a water droplet containing green fluorescent beads and coated with Teflon powder. 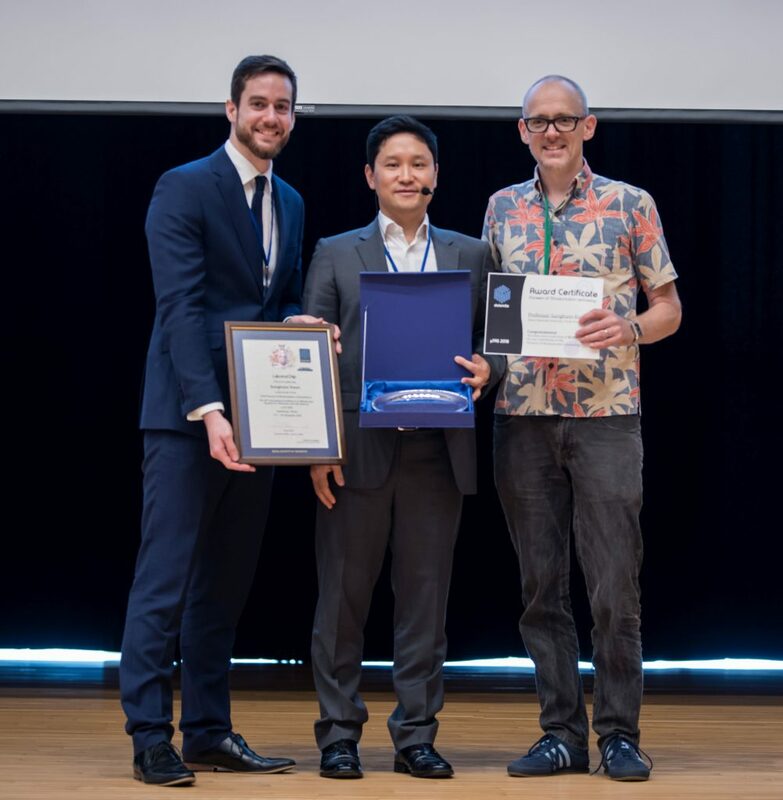 The Widmer Young Researcher Poster Prize was awarded to Richard Cheng from the University of Toronto for his poster on “In Situ Delivery And Patterning Of Skin Cell Containing Biomaterial Sheet Using A Microfluidic Bioprinter”. Congratulations to all the winners at the conference, we look forward to seeing you at µTAS 2019 in Basel, Switzerland!